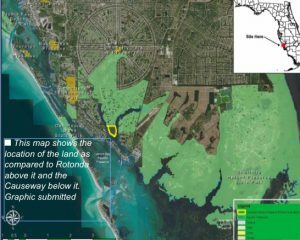 The Florida Department of Environmental Protection announces the permanent protection of the 55.7-acre Coral Creek Peninsula as an addition to the Charlotte Harbor Preserve State Park (CHPSP). The peninsula is strategically located at the convergence of East and West Coral Creeks near the town of Placida in Charlotte County, Florida. These freshwater creeks flow into Gasparilla Sound and Aquatic Preserve and thereby the Charlotte Harbor, all state-designated as Florida Outstanding Waters. Once privately owned, this parcel is within the boundaries of the northern half of Charlotte Harbor Preserve State Park. Adding this vital parcel to the park will ensure that it too is managed for the health and diversity of its natural communities and will benefit the adjoining public lands and significant waterways. The 46,000-acre CHPSP buffers more than 100 miles of the shoreline of Charlotte Harbor National Estuary and over 80,000 acres of aquatic preserves. Shallow near-shore shoals sustain an abundance of seagrasses, oysters and mudflats. This variety of habitats supports more than 100 invertebrate species, 200 fish species and 150 species of shore and wading birds. Integral to the success of this conservation project was the assistance of the Conservation Foundation of the Gulf Coast, a regional land conservancy. Conservation Foundation worked closely with the private landowner for several years, bringing the opportunity to the Florida DEP, which used Florida Forever funding to purchase and conserve the property. Adding the property to the state park will enhance management of the natural resources on both the land and the adjoining state park lands, including the removal of rampantly spreading invasive Melaleuca, which is on the site and continues to spread onto the adjoining public lands.